After 6 years, the sequel to Alice in Wonderland (2010) is released. 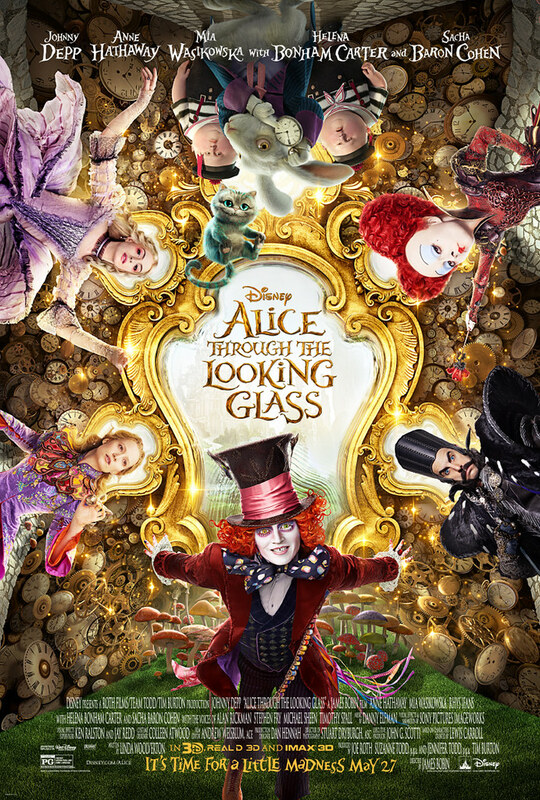 I am not a fan of the previous film, but I think I should watch Alice Through the Looking Glass. Besides, because I’ve watched the previous film, my other reason I watched this film is because of Johnny Depp. Since he’s my favourite actor, I always feel excited to watch his films. Anyway, this film is still as eccentric as the prequel, just what we can expect from Tim Burton. The costume and the makeup are all eccentric and unusual. I think that’s what makes Wonderland, Wonderland. You can barely recognise Johnny Depp as Mad Hatter. At least if you have watched the first film, you’ll know it is Johnny Depp. But if it’s your first time, you might think twice to recognise him. He’s just so good! Thanks to the makeup artists of course, but they couldn’t pull it off if Johnny Depp didn’t play his part well. He’s such a great actor and that’s why I am such a great fan of him. Even Helen Bonham Carter fits the role of the Red Queen. Anne Hathaway also looks very different from her usual role but her classic look is always beautiful even with that kind of makeup. So, let’s praise the makeup artists. They did a really great job. I haven’t read the original book, so I didn’t know what to expect from the film. However, I really think that this film is better than Alice in Wonderland. Even the setting is much much better. I like the concept of Time as a ‘He’. It makes things funnier whenever people talking about time. Like when someone changes the words “You’re just in time” into “You’re just in you” as an alternative. It is funnier if you watch it in the film. Sacha Baron Cohen is a fresh addition to the team. He’s funny and can play the part good guy and the bad guy very well. Seriously, I can’t really decide whether Time is a good guy or a bad guy until nearly the end of the film. But one thing for sure, Time is indeed funny and really adds some smile and laugh into the film. This is the last film of Alan Rickman. Even though his scenes are not much, I am still glad I have a chance to see him—or hear him—for the last time. He’s just an amazing actor. I am going to miss him. We all are, I bet. His roles in every film are always memorable and fantastic. Anyway, Alice Through the Looking Glass is about Alice who is going to save the Mad Hatter by travelling through time. In addition, we can also find out about the past. Why the Red Queen became like she is now. What happened between her and the White Queen and so on. Everything will be put in clear now. To tell you the truth, I never enjoy time travelling. Even though it is fun to see and experience, I always know how would it end. I’ve seen many films about time travelling and it is always never ended the way they wanted to. Nothing’s changed. It also applies when seeing the future. You’ll gain nothing when you’ve seen the future, except made the worst thing they desperately to avoid, happened. So, despite the fun concept of time travelling, I personally never feel excited about it. Travelling to the past out of curiosity, perhaps, I’ll do that. But to change the history? I don’t think so. As for the future, I don’t want to know. It’s the only power that I never want to have. It’s a big burden, you know. Anyway, let’s get back on track. I haven’t read the original book, so I didn’t what to expect in it. I know some of you may think this film is bad, but I don’t think so. Perhaps because Alice Through the Looking Glass is very much a fantasy and too many imaginations going on. But I think it’s a good film to enjoy. We all know how imaginative Wonderland is, so I guess the film fits in any way. In a matter of the story, Alice Through the Looking Glass is not a bad film, at least in my opinion. Plus, they talked about so many good moral lessons. There are so many moral lessons that you can learn from this film, including about time and family. I think Alice Through the Looking Glass is good and pretty entertaining. It is new and different. I give Alice Through the Looking Glass 7.5 out of 10 stars.